Construction - 4- 4"x 4" pressure treated post laminated with solid African mahogany. Gate is 2 sheets of 3/4" mahogany marine ply laminated with computer router cut design. Stainless steel post caps. Comments - This gate was heavily build weighing in at approx. 400 lbs. Comments - Mantle was hammered and scraped up to look antique. Materials - Solid maple coffee tables with Plam inserts. Comments - Coffee counter made with maple veneers and has built in garbage disposal,cup dispenser and fridge. Comments - A solid oak space saving table that folds open and slides over the base to double it's surface area. 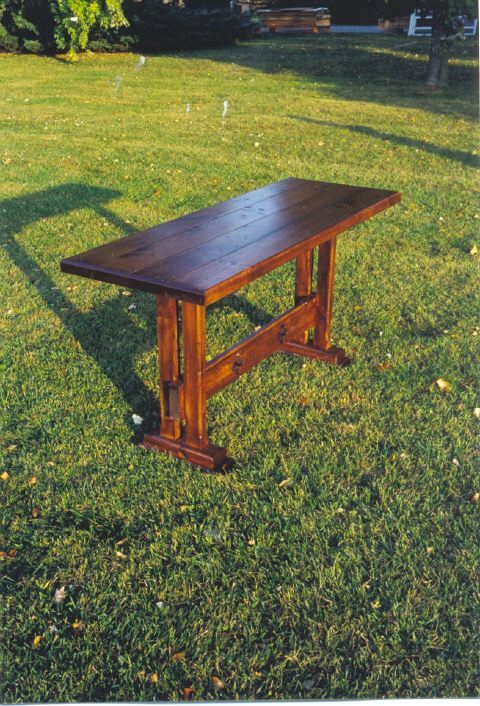 Comments - A solid pine refectory table. Antiqued, stained, and clear coated. Comments - A Japanese style step chest made heavy with MDF and cherry. Accessable from both sides. Comments - Solid mahogany folding deck chairs. Comments - Ergonomic work chair. © Copyright 2007 Watcher Works. All Rights Reserved.